Keep the adventure alive with the Ricoh WG-50, a rugged digital camera that is waterproof, shockproof and coldproof. This dependable compact camera is packed with a 16MP back-illuminated CMOS image sensor, as well as advanced imaging technologies and an impressive 5x optical zoom lens. 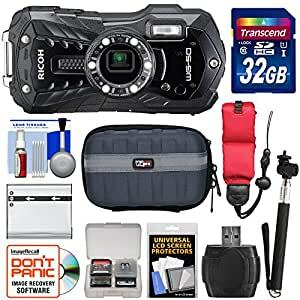 Additional features: 2.7-inch LCD monitor; full 1080p HD movies; creative functions including interval shooting, underwater mode, vibrant and slide film mode; 6 Macro LED Lights to assist with close-up shooting; plus more! Take more high-resolution pictures faster (up to 60MB/sec.) with this Transcend 32GB SecureDigital (SDHC) 300x UHS-I Class 10 Memory Card. Increase your shooting capacity with this powerful D-LI92 Lithium-ion rechargeable battery. The Sunpak Selfie Wand is the ideal way to extend the reach of your selfies. Extends up to 42 inches. Designed for use with nearly any compact waterproof camera — this Floating Foam Camera Strap is constructed of tough nylon, buoyant foam and durable plastic.